CULLMAN – Ms. Helen Cary of Cullman turned 77 on Aug. 27. Cary, who has recently undergone a hip surgery, just needed some girl time before undergoing a second surgery to repair her other hip. She planned a party at her home on Wednesday the 29th and as they always have, her dearest girlfriends came ready to laugh and have a good time. There was a special purpose of this party: the first official gathering of the Golden Dixie Chicks. Imagine a little bit of Steel Magnolia, a dash of Ya-Ya Sisterhood and a smidge of Golden Girls and you have this group of strong, funny, smart and loyal Cullman ladies. Those in attendance at Cary’s house for the inaugural meeting of the Golden Dixie Chicks were: Lois Dunkle, Becky Hudson, Doris Dake, Valerie Cadle, Hazel Heinze and Jeanette Buettner. Each of these wonderful ladies is unique and adds an important layer to the group’s dynamic. 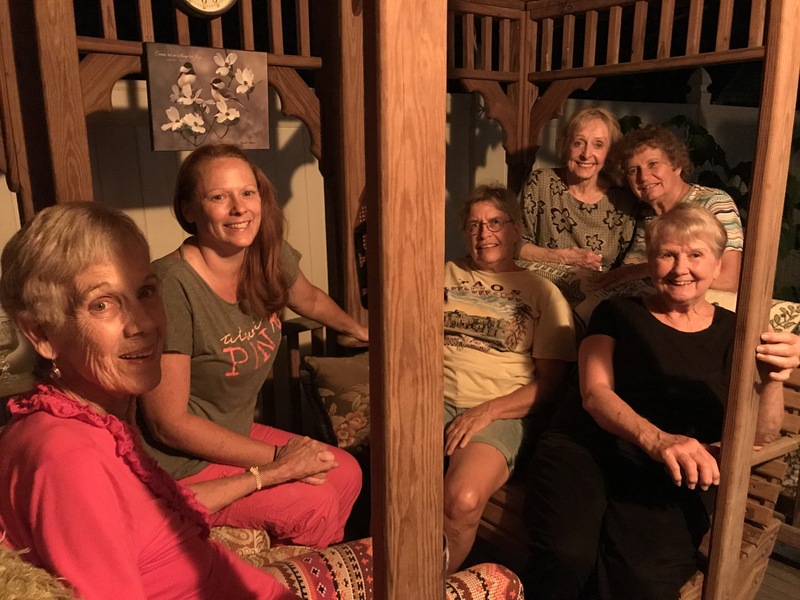 The ladies enjoyed the Amish crafted gazebo and swing as they sipped wine, told stories and playfully poked fun at each other. There was something special and exquisitely Southern about being in the presence of these women who value each other, embrace their differences and make it a point to be together often. For just a little while, the Golden Dixie Chicks erased the worry of an upcoming surgery, replaced sadness with laughter for one who recently lost a pet, and they let go of all the day’s stress. Nobody checked Facebook. Nobody stared at the phone. Nobody argued over politics. They participated and simply loved the moment. Most of the money raised for Two Shoes comes during the Belk Charity Days event. If you are interested in learning more or donating, email mimmii75@charter.net. Heinze and Dunkle both serve on the CCC (Committee on Church Cooperation). Heinze is at Cullman DHR on Tuesdays and Thursdays to interview people and access their needs. For those who might wish to donate to the CCC, their mailing address is PO Box 1542 Cullman, Alabama 35056. As the first meeting of the Golden DIxie Chicks wrapped up, the ladies said their goodbyes and love yous. Dee Dee, Cary’s Russian Blue cat, seemed happy to have his selection of seating available again while Cary was already looking forward to next time.